Green and Glassie: Peanut Butter & Jelly ~ Did you know? Peanut Butter & Jelly ~ Did you know? also known as the PB&J. As you can see the PB&J is not a low calorie food ~ but it is a healthy sandwich. Change out the bread and use natural peanut butter, low sugar jelly or fresh fruit to make it lower in calorie and a little healthier. Hubby ate the last pieces of whole wheat bread so I am having my PB&J on white bread. 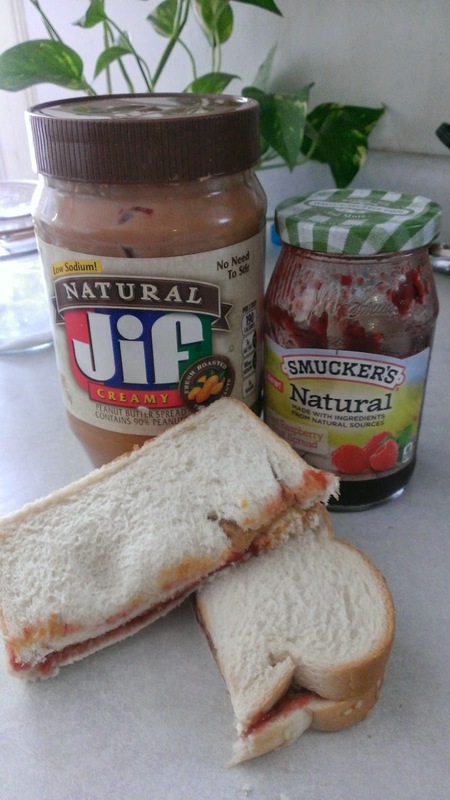 Jif Natural and Smuckers NEW Natural Fruit spread are both very tasty! I also find that a peanut butter and jelly sandwich fills me up. Which means I eat less ~ which is a good thing. I did not know! I love that it has Zinc though, that's been working so well (except the flu which got me recently) for my immune system. Love love natural peanut butter with no salt - but I've you every tried it with almond butter? YUMMY too!! I have not had a PB&J sandwich in a very long time and actually I did not realize how healthy they really are! I just have to be careful with the sugar content! I love that PB&J doesn't need refridgeration and we can easily make a couple sandwiches and bring them along and not worry about eating them within a certain time frame. I like to use all natural peanut butter, whole wheat wraps, and freshly mashed fruit for my peanut butter and jellies! PB&J is one of my favorites, but you're right, not low in calories. I just eat it slower so it lasts longer! I live on peanut butter, its one of my favorite food! and I agree a PB&J fills up the tummy fast! I love peanut butter, but I try not to eat it very often. I have to say this is something I already knew! =D My sister in law lost 70lbs in 11 months and now I am on my journey of weight loss. Her house (in which I live) is a very healthy home (minus a few snacks) where every label is pretty much looked at. When we good shop, half of our cart is fruit and veggies! It's too bad PB&J aren't calorie-free! They're one of my favorite quick lunches, but I hardly ever eat them because of all of the fat, sugar and carbs! PB&J is one of my favorite things to eat for lunch. I use whole wheat bread, and natural peanut butter. I probably should opt for a low sugar jelly. I eat almond butter and simply fruit jelly on millet bread. They work out great for me when we travel and I have a hard time finding food to eat. We eat a lot of peanut butter and jam around here :) It is so much simpler and healthier to stick with the basics! And of course, the kids love it. My husband loves eating the JIF natural peanut butter. And I only give my son Smuckers natural jelly. They're easy choices for us and I like that we have healthier (and still tasty) options. yes not a low calorie food but I love it! Have you tried peanut butter and strawberry jam? Taste good too! I love peanut butter and jelly. I eat it at least once a week. I'm a big kid. I'm a true PB&J junkie. I'd eat it every day of life if it wouldn't add on to my hips. I'm glad to see that it is healthy though. I always liked the amount of protein these had in them. When the kids were in school, I felt pretty good about them having these for lunch a couple times a week. My four year old loves peanut butter. It's a great snack with some no sugar added jam - he thinks he's getting a treat and I can feel better knowing he's getting some good nutrients. I'm a big fan of the natural peanut butter too. I still eat it occasionally for lunch. Peanut is a great nutrient. It has amazing value for so many things our bodies need every day. Currently we will only eat natural peanut butter to avoid all bad for you hydrogenated oils. I have been enjoying these sandwiches for years! This is my daughters absolute favorite sandwich in the world. We use a low sugar peanut butter and preserves with no added sugar so I don't feel bad about how many days in a row she takes it for lunch. I actually never ate PB&J growing up much, because I didn't think that I liked jelly. But now I enjoy sharing a PB&J with Bubbles every now and then! I didn't realize it had all those nutrients. Even niacin! Alrighty then! I'm having more PB&J! I ate 3 pb&j sandwiches a day while pregnant with our first. Who doesn't love a pb&j?